arrive At Bangkok Airport Received And Meet Our Local Representative And Transfer To Pattaya Hotel.check-in To The Hotel And Rest Of The Day As A Leisure. After The Breakfast In The Hotel And Transfer To Coral Island Tour With Lunch.overnight Stay At Hotel In Pattaya. After The Breakfast Check-out From The Pattaya Hotel And Transfer To Bangkok.check-in And Overnight Stay At Hotel In Bangkok.rest Of The Day As A Leisure. 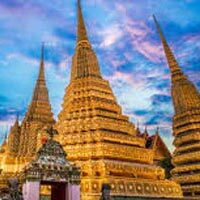 After The Breakfast In The Hotel And Transfer To Local Sightseeing Including City Tour,temple Tour,gems Gallery,(standing And Golden Buddha).overnight Stay At Hotel In Bangkok. After The Breakfast Check-out From The Bangkok Hotel And Transfer To Bangkok Airport.